Steer into the heart of the flames with these 17 different vehicles. Firestorm brings the juggernaut combat vehicles of Battlefield™ V to battle royale, along with armored transports, a prototype helicopter, and even the sought-after tractor. Some of these vehicles are just for Firestorm and the ones familiar to Battlefield V veterans have been adjusted for battle royale combat*. Although a number of vehicles are found parked throughout Halvøy, grabbing the most powerful machines requires capturing dynamic Vehicle Lockup Objectives using tactical squad or solo play. Some can also be called in using the Reinforcement flare gun. You can read more about Objectives and Reinforcements in our breakdown. Because death is permanent in Firestorm, vehicles are balanced by making fuel, and in some cases ammunition, as an additional resource needed to successfully operate them. This way, no one player can dominate the entirety of Halvøy with a roaming tank, a squad who manages their inventory together is rewarded, and Firestorm won’t become just a world of tanks. There’s enough fuel for each vehicle to get started, but when the fuel runs out, the vehicle can no longer move. Find Jerry Cans on Halvøy and use them on a to prolong the joy ride. Similarly, vehicles and towables come with limited ammunition and a steady supply of light or heavy vehicle ammo keeps their barrels hot. Fierce, tough, and deadly, these are the last things you want to see when you’re escaping the ring of fire, and the first machines you want in your corner. Each of these can also add a towable weapon (listed later). Churchill Crocodile – Only found in Vehicle Lockup Objectives, the British military used this tank’s weapons and armor to send the Axis scurrying. It also spits hot fire from the flamethrower built on the chassis. Fill the driver and three gunner seats to take advantage of this behemoth’s full arsenal. Panzer 38(t) – A light tank that no one would call “light” to its face, this riveted armor hulk holds a crew of three: a driver and two gunners. It can only be found in Vehicle Lockups. Panzer IV – A tank ubiquitous on the German WW2 frontlines and a soon-to-be Firestorm favorite, pack a full squad to do the most damage. There’s enough room for a driver and three gunners. You’ll find it in Vehicle Lockups and as a Reinforcement. Staghound T17E1 – Compact and versatile, this vehicle is a great way to flush enemies out of buildings without having to go in. Filling the driver and three gunner seats brings the most impact. It can be found in Vehicle Lockups and as a Reinforcement. Sturmtiger – A nearly indestructible colossus of a tank. Do some serious damage by packing the driver and three gunner seats. This beast will only be found in Vehicle Lockup Objectives. Valentine Mk VIII – Strong, reliable, and powerful. This tank fits a driver and turret gunner for additional heat. It also is only found in Vehicle Lockup Objectives. Hunt down these armored transports, load them up with a full squad, and haunt Firestorm like a strike team. All but the Universal Carrier are found in the wild or as a Reinforcement and can hitch a towable weapon. Kettenkrad – One day, a motorcycle married a halftrack and gave birth to the Kettenkrad. It’s a deceptively sturdy machine with room for a driver and passenger, and can be found in the wild and as a Reinforcement. Kubelwagen – A quick armored car with a mounted turret, which fits up to three, a driver, passenger, and rear machine gunner. M3 Halftrack – The Kubelwagen’s older sibling, it packs in four: a driver and three gunners. Sd. Kfz 251 Halftrack – The Kubelwagen’s other older sibling, but slimmer than the Halftrack. It can also bring four to a fight: a driver and three gunners. Universal Carrier – A light armored track vehicle that’s cramped but can hold its own with a good machine gunner. This transport carries three soldiers and is only found scattered on Halvøy. War is always about making do with what you have, and a giant hunk of metal going at high speeds is a damn good option. Truth is, every vehicle is a “combat” vehicle if you’re brave enough. Most of these can pile in a full squad, as well. Prototype Helicopter – Intelligence reports detailed sightings of a single-seat rotorcraft with room for three additional passengers. Soldiers have also been seen firing personal weapons from the vehicle. Pickup Truck – These vehicles can pack a whole squad; they’re found throughout Halvøy and can be driven with no respect for traffic laws. 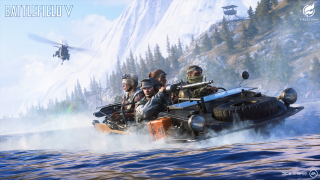 Schwimmwagen – Pile in a full squad, put a buddy on the gunner, and watch them squirm as you drive into the water with this amphibious vehicle. Commonly found near water, they are also available as a Reinforcement. Sports Car – Sure it only fits two soldiers, but you’ll be two really fast soldiers. These are parked at random in Halvøy and available as a Reinforcement. Staff Car – If you weren’t being chased by a fiery death, we’d advise you to garage this vehicle and sell it at auction one day. For now, put a full squad in it and drive it away or into enemies. Parked in the wild, it’s available as a Reinforcement. Tractor – These modest vehicles are used for all types of agricultural work on Halvøy. There’s no reason why anyone in their right mind should use it for anything else. Tow an anti-tank gun or AA Gun to wallop foes or hold down a key Objective. Both below are found randomly in the wild and are designed for one soldier to operate. Firestorm will expand after launch, with new features and improvements coming to all Battlefield V players as part of Tides of War, including an initial introduction of a Duos mode in April as part of Chapter 3: Trial by Fire. Enter mankind’s greatest conflict now with the Battlefield™ V Deluxe Edition or Standard Edition on Xbox One, PlayStation®4, and PC. Play the full game with Origin Access Premier or try it first for 10 hours with EA Access or Origin Access Basic**.Sign up today to receive the latest Battlefield news, updates, behind-the-scenes content, exclusive offers, and more (including other EA news, products, events, and promotions) by email. Follow Battlefield on Twitter and Instagram, like us on Facebook, and subscribe to our YouTube channel. Hop in and join the Battlefield Community on the Battlefield Forums, and discuss with us on Reddit and Discord. **CONDITIONS, LIMITATIONS AND EXCLUSIONS APPLY. SEE ea.com/ea-access/terms AND origin.com/store/origin-access/terms FOR DETAILS. Secure the Fire Axe melee weapon via a new Weekly Challenge focusing on Firestorm. Unlock the Firestorm-themed weapon skin as the latest Battlefield V Chapter continues.